Meanwhile, Africa is growing and demanding an increasing number of consumer goods and food products. The continent’s partnership with China can help the region obtain sufficient products to cater to a growing population and economy. 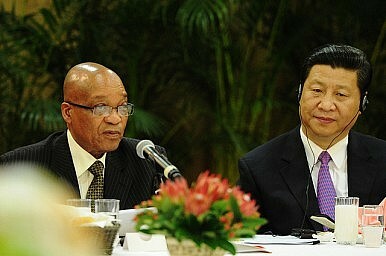 After all, China remains Africa’s largest trading partner, and this relationship does not appear to be waning. Also, contrary to assertions that China has taken African land holdings to produce crops for export to China, reliable sources have confirmed that reports of land takings have been grossly overstated. China will discuss its economic relationship with Africa at the upcoming FOCAC. The FOCAC will promote Sino-African partnership, under the theme of “China-Africa Progressing Together: Win-Win Co-operation for Common Development.” China is expected to announce a loan package at this meeting, as it has in previous years. This will assist Africa with ongoing construction of infrastructure. President Xi Jinping will also support African integration, which promotes peace and security, and from a practical standpoint will improve China’s economic activity in the region. Projects to be discussed at the FOCAC summit include the “three networks” – a regional high-speed rail network, highway network, and aviation network, among other items. China’s investment in Africa appears to be changing for the better, as both China and Africa grow. China has become a more sophisticated investor, and has imposed stricter requirements on its own companies investing in Africa and has shown an increased willingness to provide African countries with jobs and technology. The FOCAC should help take China’s relationship with Africa forward. China’s Africa Strategy: Going Global With Infrastructure InvestmentGreen Shoots Sighted for Asia’s EconomiesAn Oil Discovery Before Systemic Reform in Pakistan Would Be a TragedyIn Myanmar, Jittery Investors Threaten Long-Term DevelopmentAsia’s Elections: Market Moving or More of the Same?